Gone are the days when changing your fragrance cost a trip to Boots and £1-something courtesy of Impulse. Today my hunt for the perfect fragrance is taking me upwards in place and price – specifically Liberty, where my nose hangs out at the counters of Le Labo, Diptyque and Byredo, irritating each and every parfumier. I’m after something floral but manly and here is my shortlist. As fragrance like wine come with insufferably poncey descriptions, perhaps the most baffling should be the one I buy? Iris EDP, Le Labo: Iris is one of the most precious essences in the world. It’s the origin of the creamy and woodsy nobility of this exclusive fragrance. The best of the Patchoulis then waft in, bringing with them sensual depth. The perfume is reinforced by a musky base, our very own secret. The result is remarkable elegance. 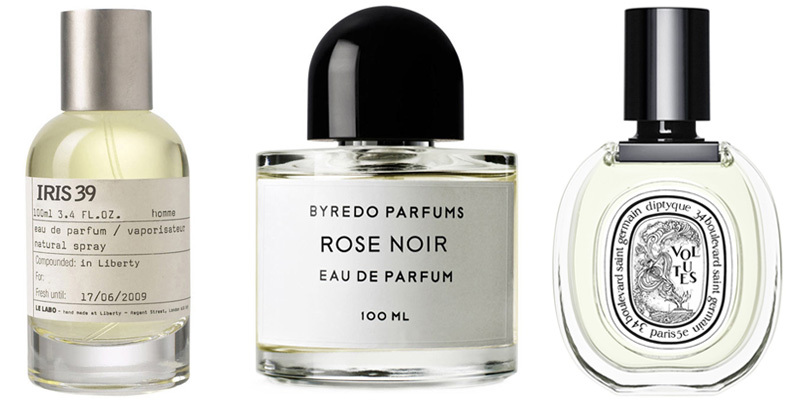 Rose Noir EDP, Byredo: In Rose Noir, the classic symbol of love and devotion is updated. A traditional olfactory rose, the Damascene, is made potent and contemporary once again by darkening its character. Rose Noir becomes a decadent, dirty rose with intense and animalic quality. Volutes EDT, Diptyque: Raw addiction in a fragrance created from tobacco. A unique amber signature, a combination of softness, warmth and aromatic notes…Volutes reposes on an accord blending a tobacco absolute and an Amsterdamer note with hints of wax and honey. It exudes a perfume of mild tobacco of eras lost… the imagined scent of the smoke of Le Khedive cigarettes. They’re all equally ridiculous but I enjoy ‘woodsy nobility’ the most so Le Labo it is.